Sprout: One of the Best Japanese Romance Drama Ever! 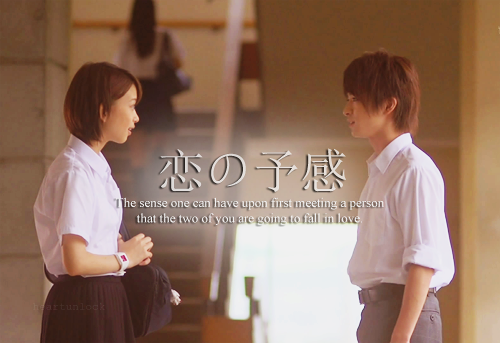 Sprout is a 12 episode Japanese school romance drama based on a popular manga by Nanba Atsuko. The story revolves around four high school students Miku (Aoi Morikawa), Sohei (Yuri Chinen), Hayato (Jesse Lewis) and Miyuki (Fujiko Kojima). It's a drama were everyone who has loved can relate to and to those who haven't, I'm sure you'll have an idea of what love actually is. The plot is typical. It revolves around Miku who is determined to be with only one boyfriend to love forever. One afternoon, Miku was sick and was taken to the clinic by a mysterious boy who she refers to as her "fated person". Soon, she learns who that person is but he is no longer available since he is already dating one of the most pursued female students in school, Miyuki. Will Miku's idealistic love to be with her "fated person" persist? Or will Miku end up with Hayato who almost every girl in school is chasing after? What makes the series worth watching is not only the plot also the chemistry and portrayal of the characters. Although I kind of felt how the story will go, but I just had to watch every scene because I could sense the flow of emotions going on between the casts. Like Miku, I dreamed of loving only one boyfriend in life and believing in such things like "the one". But, love is not as simple as that. It has so many complexities that things might turn out not as we expected. Even things may not be perfect as we hoped, what matters most is that we can find love and be happy. My little sisters did not like this series because they found all the characters to be not good-looking. But, that makes it more realistic for me. And, I really don't need good-looking characters to make something interesting for me because I see things with more depth even in actual life. 1. The Master Mode Button can be activated by pressing the Zoom Button. The Yamaha Rhino is a capable off-road side by side that can be customized with the right accessories to fit your needs whether its for work or play. If you want to take your Yamaha Rhino on the streets, make sure you have the D.O.T approved accessories to make it street legal. Want to go out on a snow or ride against the strong wind, get an enclosure that will keep you safe. Or if you want more durability a body or a roof would b great. And, against the cold, you should add some heaters too to keep you warm. Your Yamaha Rhino won't be at its best performance without the appropriate wheels. Too assure durability choose top brands such as Carlisle, Maxxis, ITP, and STI. The windshield is also important to assure that you have a clear and accurate view. There's no action without sounds so put some stereo on your Yamaha Rhino. Make it look cool with some skid plates, lights, bumpers, winch, and awesome exhaust system. Finding yamaha rhino accessories could be tedious as you travel from one shop to another. But, you can also make it easy by searching in the internet. You can find everything by just typing what you are looking for. One of the best sites for Yamaha Rhino Accessories is Side by Side which offers FREE shipping. That's really hassle-free and convenient since accessories are not only big and bulky, they are usually heavy too. So, you need a little help in designing your own calendar? Well, you’ve come to the right place. Check out our helpful tips below on how to find easy online tools for creating the masterpiece you’ve always imagined. If you’re creating your own calendar and want to add some fun family photos to the mix, you may need to edit them to ensure that they are suitable for your design. Whether you need to crop, recolour or just adjust, there are a number of online tools available to help. Photo editing on software can either be purchased or downloaded for free, depending upon which website you visit, so if you don’t want to spend too much money, keep your eyes open for a free trial. While creating your calendar can be fun, the design process if often time consuming and trying. If you need some inspiration to get the wheels turning, head to DIY forums, which can provide a great source of crafty information. You’ll be pleasantly surprised by the great ideas that fellow calendar makers can provide, so why not jump online and be inspired today! Online printing companies often provide a vast range of personalised products, including calendars. If you aren’t the creative type, but still want to design a calendar of your own, head to an online printing store to select your design and upload your photos and text. While you still get the final say in how your masterpiece will look, you can let someone else do the heavy lifting, ensuring that your final product has a professional touch. Cheap calendar printing Calendar Design Templates If you’re looking for a little help when designing your very own calendar for the first time, research the options for calendar design templates. A number of stationery suppliers and online printing companies have a range of designs to choose from; allowing you to decide what will look best hanging on your wall. Desk, wallet, poster and wall calendars are all designs that you should consider. Designing your own calendar can involve a great deal of work and, let’s face it; we all prefer to add the pretty pictures than to create those repetitive little calendar squares. To make light of heavy work, make the most of template creators, where you can download calendar sheets, displaying the correct days and dates for your chosen year. Whether you decide to create your own calendar from scratch or design a customised template online, you’re sure to be creating something that will take pride of place in your home. Remember, if you aren’t too creative, there is still a number of ways that you can great your very own calendar online. Artificial sweeteners have established themselves as an alternative to natural sweeteners. However, they cannot provide the same benefits as their natural counterparts. Instead, they have numerous disadvantages that relate to health. For example, studies have established that they are carcinogenic because of their artificial chemical components like Saccharin. Artificial sweeteners are also unhealthy since they contain Aspartame. This is a non-caloric sweetener that puts people at the risk of acquiring extreme heart palpitations, headaches, ADHD and seizures among others. The danger posed by artificial sweeteners leaves natural sweeteners as the only safe sweeteners for human consumption. Thanks to the existence of many natural sweeteners in the market, people will never run out of choices. They can purchase these sweeteners from grocery stores or health food shops. Consuming natural sweeteners will assist people to reduce the levels of calories in their bodies. This benefit is ultimately reflected in blackstrap molasses and maple syrup. These natural sweeteners have low levels of calories concentration, which bodes well for individuals struggling with weight issues. This is unlike natural sugars that normally have high calories in them. People can also benefit from reduced calories by consuming stevia. This plant, a member of the Chrysanthemum family, is non-calorific to ensure that they provide nutritional benefits while maintaining low calories. There are many stevia-based natural sweeteners most notably, Natvia. These sweeteners are sugar-free, which guarantees their low-calorie level. This is the most important benefit that comes with consuming natural sweeteners. Various types of natural sweeteners have different nutrients like minerals and vitamins. These nutrients are integral in keeping the body healthy by providing it with nutritional benefits. At the same time, they ward off pathogens that could cause harm to the body. Natural sweeteners keep the body safe from certain diseases by boosting people’s immune systems. Those who incorporate them in their diets are usually safe from ailments like atherosclerosis. Natural sweeteners are also a viable solution for those suffering from Type 2 Diabetes or high cholesterol. Their disease-fighting capabilities owe credence to their anti-oxidising properties. Their ability to enhance the immune system is also down to the fact that they are anti-bacterial agents. Natural sweeteners are also efficient in enhancing weight control or reduction. Most of them have low calories, which make them a perfect fit for solving weight issues. They are rich in nutrients that nourish the body and ward off persistent hunger. Conveniently, people need not develop food addiction and incur a humongous problem like obesity. Coupled with low cholesterol content, natural sweeteners do not cause problems related to the heart. Sweeteners have become an integral part of everyone’s diet. However, it is important that people choose sweeteners that will provide them with health benefits. The Sweeter Life Club have many great low calorie lunch, breakfast, dinner and dessert recipes that are sure to tempt your tastebuds!